Welcome to Cub Scout Pack 1069, Woodsboro, MD! So, what are Cub Scouts all about? KIDS have a blast participating in fun activities that teach honesty, bravery and respect for others and the environment. PARENTS get support from a program that strengthens character, develops citizenship and enhances mental and physical fitness. Cub Scouts is for boys in the 1st thru 5th grades. 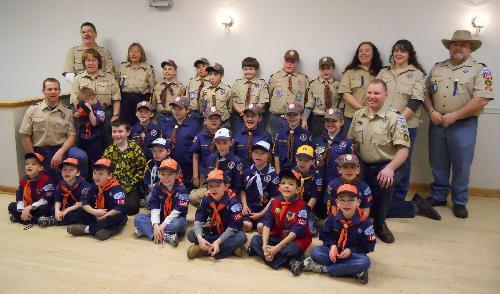 Cub Scout Pack 1069 is primarily comprised of boys from the Lewistown and Woodsboro/New Midway Elementary School areas. Cub Scouts is a year-round program — there is always an opportunity to do something! Den Meetings: Boys meet 2 or more times per month with other boys in the same grade. Meeting times are arranged by the Den Leader and families that make up the Den. This is an excellent opportunity to make new friends, work on specific skills and explore new things! Pack Meetings: This is a meeting for all Cub Scouts and parents to get together to recognize achievements that have been accomplished during each month. We currently meet on the FIRST TUESDAY of each month at the New Midway Elementary School from 7-8 pm. Presentations, games and FUN are a big focus for these meetings. Ask us what else we do - please use the Contact Us link above to inquire for more info! For more information about the Cub Scout program of the Boy Scouts of America, please visit the official BSA Cub Scout web site.